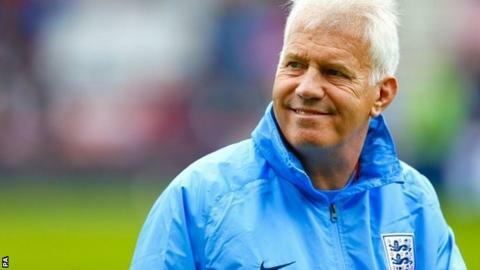 Former England assistant manager Brent Hills has been appointed head of women's elite development by the Football Association. The FA has also installed ex-England striker Marieanne Spacey as assistant to national team boss Mark Sampson. Spacey will also be in charge of the Under-23s team and take up the role of coach developer in the women's game. Marieanne Spacey scored 28 goals in 91 internationals for England. "I think my various roles are really important for the future of women's football in this country," said Spacey. "I am really looking forward to the challenge. "The prospect of working with two different England squads really excites me, as does helping any female player that wants to become a better coach, because we need more female role models across the game." Hills was assistant to ex-England manager Hope Powell and, after she was sacked by the FA, he took charge of England's opening World Cup 2015 qualifiers before Sampson was appointed in December. He will oversee the England teams at under-15s, under-17s and under-19s level as well as the female centre of excellence programme, and report to FA's director of elite development Dan Ashworth. Hills and Spacey will start their new roles in January 2014.